Trigger: Move to Castilla Base 1. Pre-requisite: Castilla Mines until after Argus & Chimera, do the quest given by Elisa to deliver medicine to base 2. Talk to Elisa at Castilla Base 1. Talk to Elisa again, then change channel/relog and talk to her again. Move back to Castilla and talk to Elisa to finish the task. Talk to Elisa. She will ask you to collect 40x Dragonfly Silk from Bigfoot (1 in 21) and/or Elite Bigfoot (1 in 10) in the Snowfield of the Ice Wizard-map. Return to her with the items when done. Change channel/relog and talk to Elisa again. She will ask you to collect 50x Mega Quartz (available in various missions), 50x Clear Rum (Drops in Zeia/Errac and Culverts) and tongue of the Merman Eater (quest item gotten by killing the boss in Toubkal Mines Bounty Hunter Mission, 100% drop). 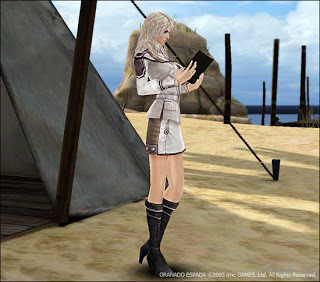 Return to Elisa with the items to receive her character card. Pre-requisite: Completed Elisa's recruitment quest & character creation, completed Adriana's extended quest, completed Adriana's recruitment quest & character creation. With Adriana as your team leader, talk to Elisa. With Elisa in your team, go to Reboldoeux F4 to trigger a quest dialogue. With Elisa in your team go to Coimbra G9 to trigger a quest dialogue. WITHOUT Elisa in your team, go to Reboldoeux E10 and talk to Panfilo. Return to Panfilo with the items to receive "Picnic Lunch Box". Without Elisa in your team, go to Ferruccio Junction E4 to trigger a quest dialogue into a non-combat instance ("Picnic with Elisa"). Talk to Elisa. Collect 3 Growth Stones and give them to her to receive the "Therapy" stancebook.